I'm reading James Berlin's Rhetoric and Reality: Writing Instruction in American Colleges, 1900-1985. Considering that this book has a rather dry title and ends with the year I was born, I wasn't exactly expecting it to be riveting. However, I've been pleasantly surprised by both how interesting the history of rhetorical study in America truly is and Berlin's intelligent commentary on these complex interlocking systems and pendulum swings of favored practices and philosophies. This is a dense book that's taking me longer to read than I would like, but I feel like the background I'm gaining is worth the extra attention. Instead of choosing a passage to write about in some contemporary vein as I've been doing for the earlier works in this series, I decided to use this text to do something I've been wanting to do for a long time: try to make an infographic. This is my very first attempt at an infographic, so please forgive my inexperience. I took Chapter 1 from the book, which details the different strains of rhetorical theory that were popular during this period. You can use this chart to figure out which school of thought best fits you (click to enlarge). This is a great. I must read this book. 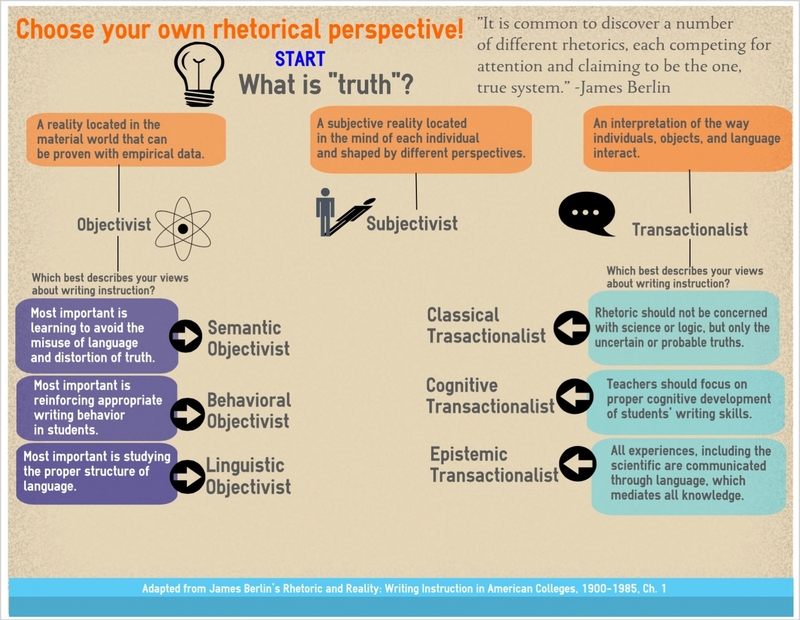 I identify with being a Semantic Objectivist and an Epistemic Transactonalist. I definitely identify with Epistemic Transactionalist, too!